Celebrating the creativity and dedication of our supporters. Whether they are hosting cocktail receptions in a New York City apartment or a fundraising pasta dinner in a middle school gym; whether they are golfing for good, running half marathons, or purchasing handmade items from The Mabinti Centre, our supporters astound us. This month, we are so excited to watch our new friend, Sara Safari, climb Mount Kilimanjaro to raise funds and awareness for women living with and recovering from obstetric fistula in Tanzania. 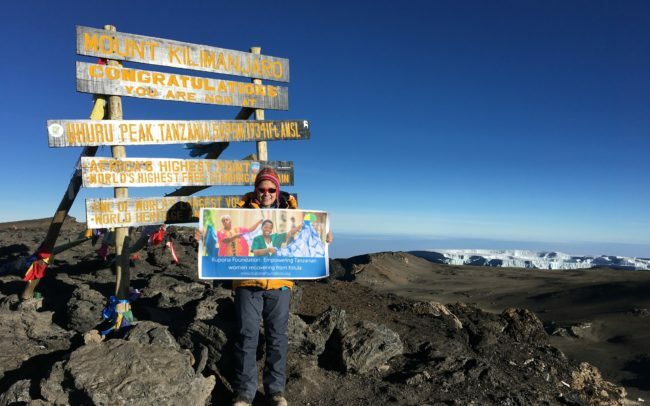 Her goal is to raise $19,000, $1 for each foot of Kilimanjaro’s elevation. Today, Sara continues working, and climbing, to empower women and girls. She aims to climb the highest mountains on every continent (The Seven Summits) to raise funds for seven charities working for women’s empowerment. When she completes her climbs in July 2018, she will be the first Iranian in history to conquer The Seven Summits. Kupona Foundation is honored to be Sara’s charity of choice on the African continent as she summits Africa’s highest mountain, Kilimanjaro, this week. Thanks to Sara’s incredible commitment, and the contributions of her supporters, we will be able to reach more women living with fistula, supporting their comprehensive treatment and rehabilitation, and their reintegration to their community as they rebuild their lives. The road to recovery is not an easy one, but like Sara’s climb to the summit of Kilimanjaro, their destination is within reach. We’re excited to conquer fistula together, returning hope, health and empowerment for women in Tanzania. Are you inspired by Sara’s incredible efforts on behalf of the women we serve? You can support Sara’s CrowdRise project today. You can also follow her journey on Facebook and Instagram.